Europian SEGA and Sonic merchandise collectors will be pleased to hear that they will soon be able to spend to their heart’s content at Europe’s very own SEGA Shop! While details are sparse at the moment, a “Coming soon” teaser banner has appeared at the Numskull & Geekstore stand at this year’s EGX currently taking place at Birmingham’s NEC arena. The banner at the event indicates that the shop will be powered by official videogame merchandise producers Numskull, who have to date already created a whole host of cool SEGA and Sonic related merchandise. 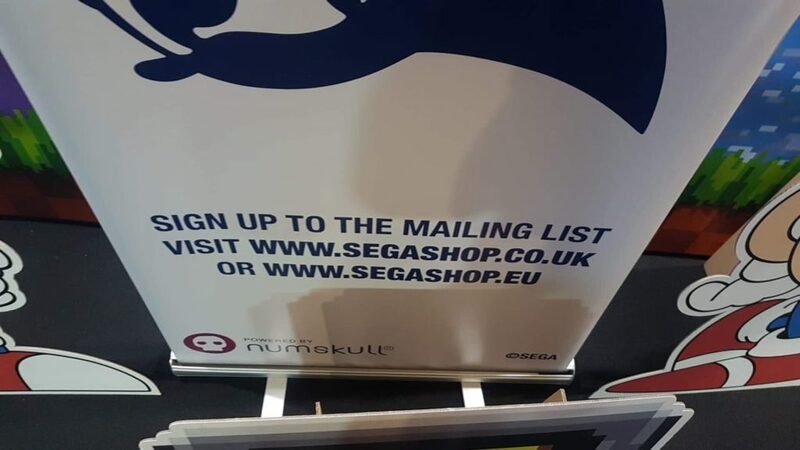 While the site is yet to officially launch, those interested can sign up to the mailing list at www.segashop.co.uk or www.segashop.eu. We can’t wait to see what goodies are in store soon! As always, keep up to date on all Sonic merchandise news with TSS!